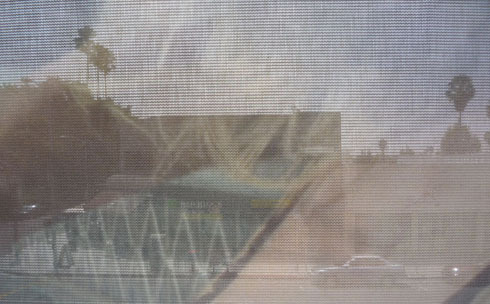 Billboards and supergraphic signs touting the new version of “Melrose Place,” the prime-time soap opera popular in the 90’s, have appeared like a plague of locusts in L.A., particularly in and around namesake Melrose Ave. One of the supergraphic ads is wrapped over the second-story windows of a building whose owner is the subject of a criminal complaint stemming from the installation of another supergraphic sign on the building earlier this year. City inspectors said that the sign, advertising Chase bank, was installed without a permit, violated a moratorium on any new off-site advertising signs, and constituted a safety hazard by impeding possible escape in the event of a fire. 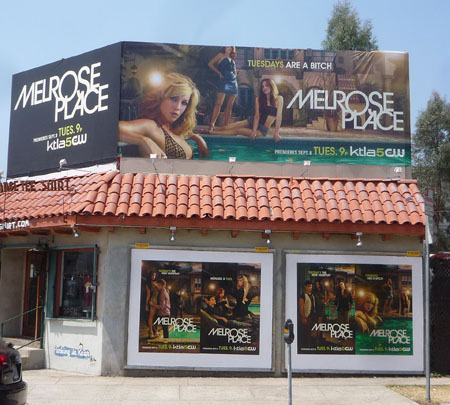 The sign was removed after the building department referred the complaint to the City Attorney’s office for criminal prosecution, but the new sign for “Melrose Place” appeared just days ago in its place. The off-site sign moratorium is still in effect, and two weeks ago the City Council passed a permanent ordinance prohibiting any new billboards and supergraphic signs. The building at 7201 Melrose Ave. is owned by Macculloch Properties, 662 Macculloch Drive., in Brentwood, according to city property records. Listed as principal of the firm is Hamid Khamneipur. 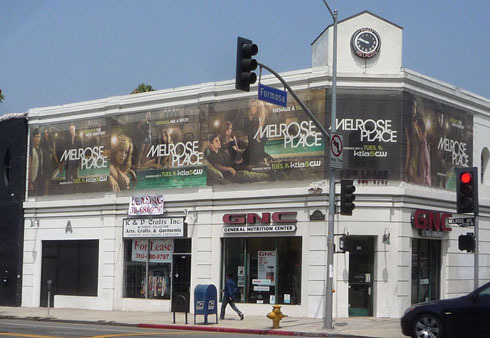 “Melrose Place” is produced by the CW network, and broadcast locally by KTLA, Channel 5. It is scheduled to begin airing Sept. 8. The sign at 7201 Melrose isn’t the only supergraphic ad for the TV show put up in violation of the city ban. Below is a building turned into a promo for the show just a few blocks down the street. There aren’t any windows behind the sign, however.